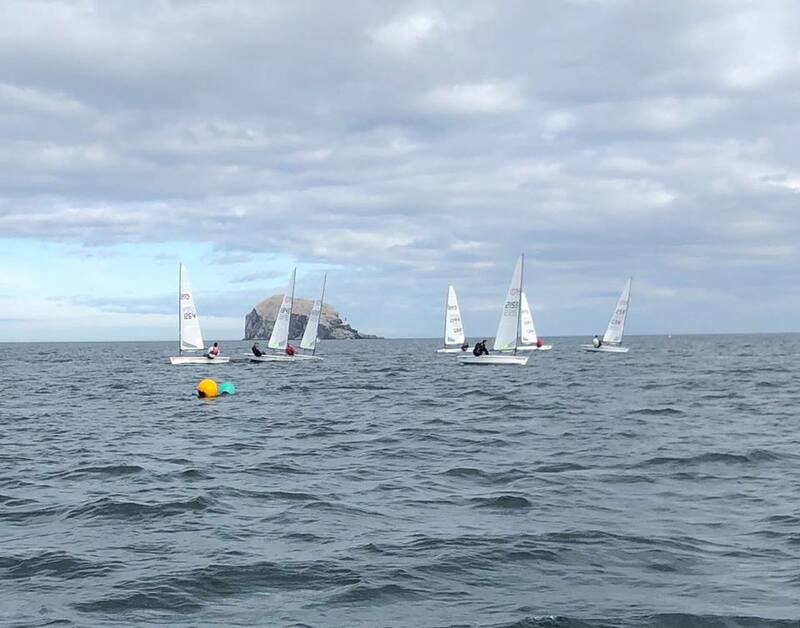 Nineteen sailors signed up for the RS Aero Northern Championships at East Lothain Yacht Club in the seaside town of North Berwick. Six local sailors were joined by visitors from clubs as far apart as the Isle of Man, Warrington, Yorkshire, Lincolnshire and Aberdeen. Several arrived Friday and sampled the delights of the Puffin and the Herringbone in North Berwick, keeping up the traditional Northern race preparation! The East Lothian coast was at its most benign for on Saturday morning, with a light to moderate westerly breeze and a relatively gentle swell. Race Officer Bill Roberts set a trapezoid course between the islands of the Bass and the Craig, to the east of the sailing club. With many Northern Circuit regulars chasing a good score for the traveller series championship, plus a few less weel-kent faces hoping to make their mark, it was all to play for. 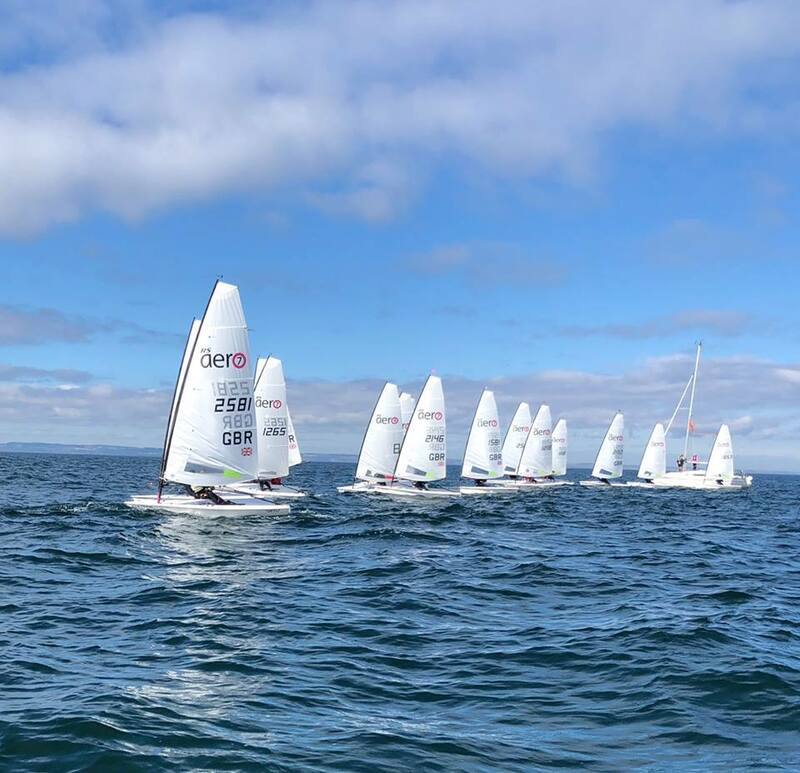 Most opted for the 7 rig, however local sailors Robbie Lawson and Donald Maclean opted for RS Aero 9 rigs, and young Ellen Clark, sailing an RS Aero competitively for the first time, opted for a 5. Robbie Lawson took line honours in all three races on the Saturday, scoring 2, 3, 3 on handicap. 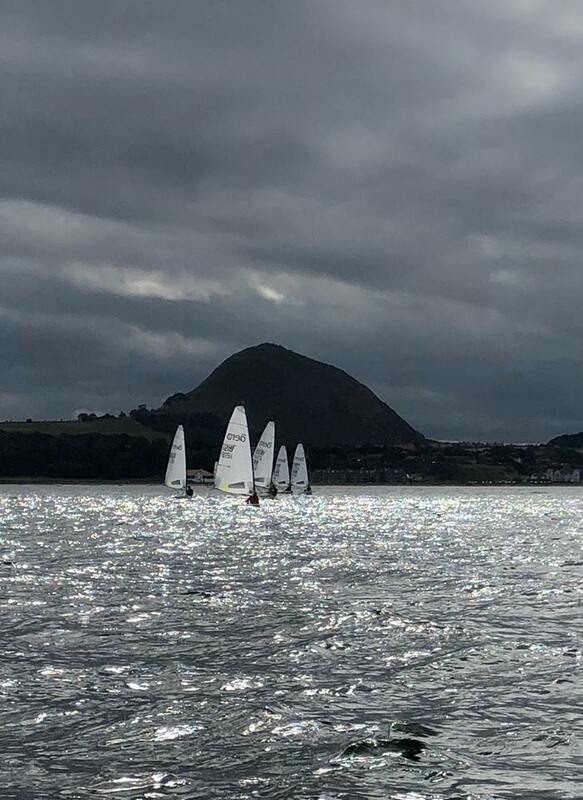 In the 7 fleet, racing was close in the first two races between Angus Boyd of ELYC and Gareth Williams of Leigh & Lowton SC, both showing upwind speed everyone else struggled to match. They scored one win each. A few were caught out by the significant tidal flow at the windward mark. By race 3 the wind had picked up a little and Iain McGonigal (ELYC), having been DNF’d for failing to go through the gate in race 2, got a clean start and led all the way. Angus Boyd again showed his consistency to take second and finish the day on top of the series. After three hard series races, ELYC laid on an extra treat for the tired sailors; an optional one-off race around a the local islands. A beat of over 2 miles westwards to the Lamb, against the tide in a building breeze, saw the local sailors heading inshore from the start to rock hop their way up the coast. Visitors less familiar with the coastline followed tentatively. Iain McGonigal and John Wilcox, (ELYC) ducked and weaved all the way up, with Iain just reaching the Lamb first. The island was rounded to starboard a with a turn downwind to leave the Craig to starboard. The downwind leg in a good 15-20kts with bigger waves caught a few out, as did the rounding of the Craig which involved crossing through the wind shadow of the island. A capsize behind the Craig put paid to John’s chance of catching Iain but he recovered well and still finished second. First visiting sailor was Steve Stewart (Yorkshire Dales SC). As it turned out this was a race that only a local should win, so fair play to all the visitors who got round! Saturday nights on the Northern circuit are legendary, however this was a subdued affair. After a free drink provided by NB Gin and an excellent meal provided by Andreas and Karen in the ELYC Sail Loft Cafe, including FREE PUDDING! of course (thanks to Steve at the Airshed), everyone retired to the bar where exhaustion set in. This resulted in the earliest Saturday night in the history of the Northern circuit. Sunday dawned windy as forecast, with wind against tide generating some big wave sets. A few decided that discretion was the better part of valour and opted not to go out, and a few more opted for a 5 rig. Out on the race course the wind was well into the 20-30kt range, with gusts of 31kts recorded at the club weather station on the shore. Chris Perry (Aberdeen and Stonehaven YC) and Peter Craggs (York RI) mastered the conditions first and shared the first two races. The remaining positions were decided mainly by who capsised the fewest number of times! The wind continued to strengthen and in race three Robbie Lawson took the line honours again, but in a 5 rig! However as he was sailing under his 9 rig handicap he only managed second! Iain McGonigal (ELYC) in the 7 rig managed to get round the 3 laps with the mast pointing at the sky and took the win. 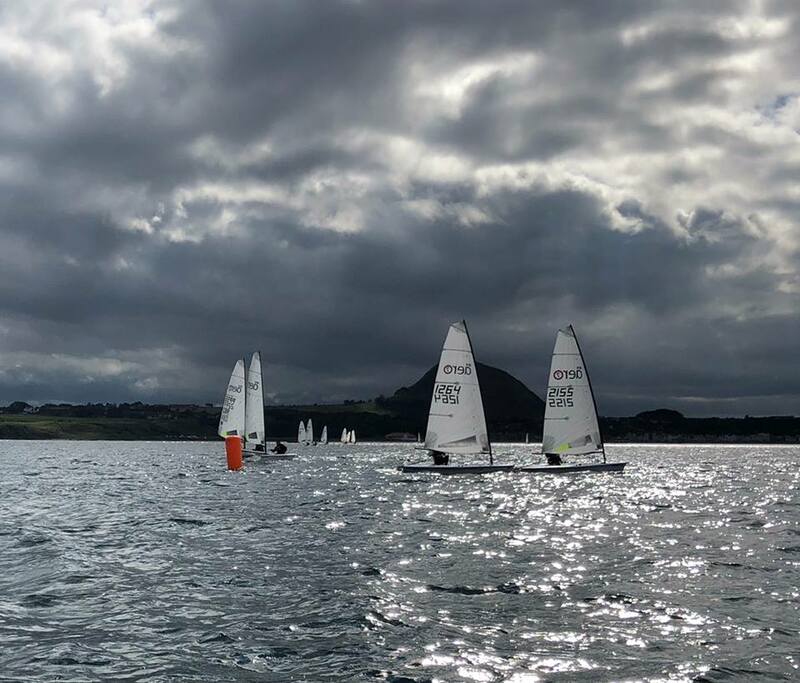 Angus Boyd (ELYC) continued to sail consistently and did enough on day 2 to maintain his first-day lead and take the series overall, with Iain McGonigal only 1 point behind and Peter Craggs (York RI) coming through to 3rd overall. A great weekend’s sailing, with the closeness of the racing and 5 different race winners testament to the growing quality of the Aero fleet, among both circuit regulars and those we don’t see around so often. ELYC put on a very well-organised event both on shore and on the water, and a big thanks from the RS Aero fleet to all the volunteers and to the sponsors Airshed and NB Gin. ELYC host the next RS Aero Nationals from 24th to 28th July 2019, and we hope that our Northern friends return and many more will come enjoy this fantastic venue next summer.